On this page we’re going to walk through all settings available to you in WooCommerce. You’ll find information about General WooCommerce settings as well as Product, Tax, Payments, Shipping, Accounts, Email, API, and Webhooks. To get started, go to WooCommerce > Settings. Defines your shop’s address country and state (i.e., where you are based as a seller). It determines default tax rates and customer locations. Choose to sell to all countries or to specific countries. You can choose multiple specific countries or states. Choose to ship to only those countries you sell to, or a subset of countries. You can disable shipping & all shipping-related functionality. Choose the location we assume site visitors are in, before they enter it, to calculate tax and shipping. Shop base address tells the system to assume they are in the same location as your shop. No address gives them no location, so no taxes are calculated until they provide an address. Geolocate address verifies where their current location and calculate taxes accordingly. Geolocate with page caching support is the same as above, but does the geolocation via Ajax. You may notice your website URLs have a ?v=xxxxx appended to them. This is normal to prevent static caching of prices. Enable or disable taxes on your store. Disabling taxes hides the tax settings page. Enable or disable coupons on your store. Coupons can be applied from the admin edit order screen (for unpaid orders), cart and checkout pages. Enable the use of coupon codes – Select to enable the use of coupons in your store. Calculate coupon discounts sequentially – Changes the coupon calculation logic to apply coupons in sequence on top of one another, rather than basing them on the original product prices. 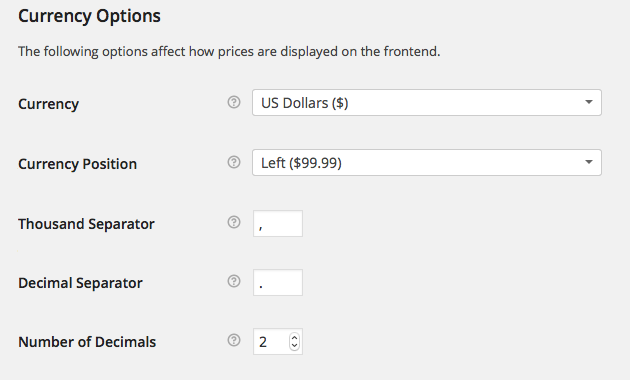 Options that affect how prices are displayed on the frontend. Choose the default currency for the store. Only one may be selected. Settings for products and how they are displayed, including image sizes, inventory and downloadable product settings. In the General section are Shop Pages, Measurements and Reviews, allowing you to control checkout settings, select units of measurement, and enable/disable product reviews and ratings. Select what page you want to be the default shop page. Need not be the Shop page that WooCommerce installed, or can be skipped if you use another method to display products. Redirect to cart page after successful addition – Automatically takes customer to the cart page upon adding a product. Enable Ajax add to cart buttons on archives – Adds the ‘Add to Cart’ option to shop archive pages. Set an default ‘placeholder’ image to appear on the front end when no other image is available. This could be your brand logo or an image of a signature product or service. Select a unit of measurement for weight and dimension of products from the dropdown. 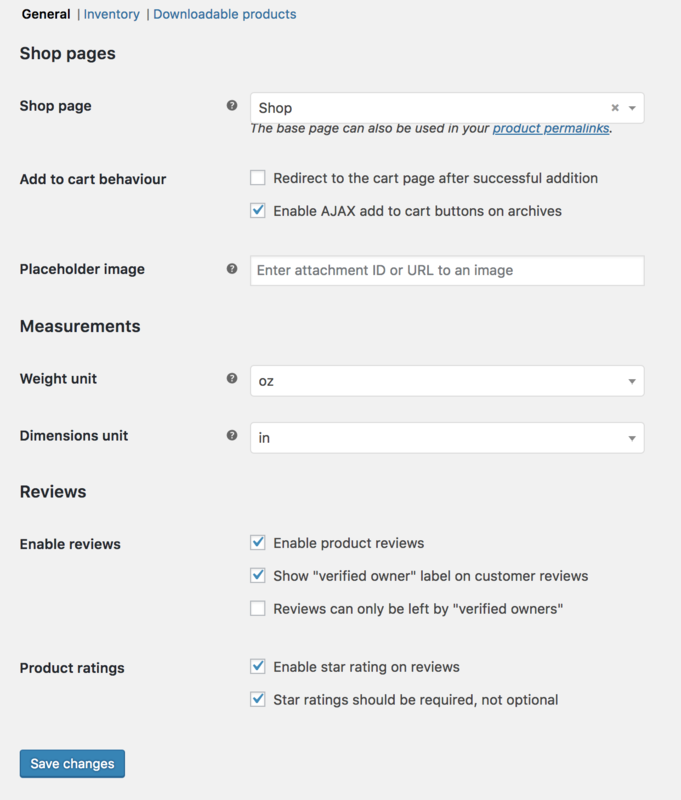 Note: Product Image and Store Notice settings are now located at WooCommerce Customizer. To edit your shop’s inventory options, go to: WooCommerce > Settings > Products > Inventory. Enable stock management – Inventory for physical products is auto-managed. You enter quantity, and WooCommerce subtracts items as sales are made, displaying: Stock, Out of Stock or On Backorder. More info at: Stock Management Improvements. Disable (box left unticked) – Inventory and status for physical products must be entered manually. You can still Enable Stock Management on a per-product level, if desired. More info at: Managing Products. Hold Stock (minutes) – Hold products (for unpaid orders) for X minutes. When limit is reached, the pending order is canceled. Leave blank to disable. Notification Recipient – Enter email address for notifications. Out Of Stock Threshold – Number of products to trigger out of stock status. Out Of Stock Visibility – Choose to hide out of stock items from catalog. Go to: WooCommerce > Settings > Products > Downloadable products. Controls how your store provides downloadable files to purchasers. Force Downloads – Files are ‘forced’ to download via a PHP script. Files are not accessible to anyone but purchasers, and direct links are hidden. X-Accel-Redirect/X-Sendfile – Similar to ‘forced’ above, but it has better performance and can support larger files. It requires that your hosting provider supports either X-Sendfile or X-Accel-Redirect, so you need to check with them first. Redirect only – A download URL links the user to the file. Files are not protected from outside access. Most stores should use one of first two methods to keep files safe from outside access. Redirect should only be used if you encounter problems or don’t mind downloads being non-secure. Select if downloads require login – Does not apply to guest purchases. Grant access to downloadable products after payment – Enable to grant access to downloads when orders are Processing, rather than Completed. Go to: WooCommerce > Settings > Tax. Taxes are very important and complex enough that we’ve written more about them in their own section of our docs. More at: WooCommerce Tax Settings. Go to: WooCommerce > Settings > Shipping. The main shipping settings screen is for Shipping Zones. Think of a shipping zone as a geographic region where a certain set of shipping methods and their rates apply. Ship to billing address or customer shipping address by default or only ship to the user’s billing address. Go to: WooCommerce > Settings > Payments to control which payment gateways are enabled. Installed gateways are listed and can be dragged and dropped to control the order in which they display to customers on the checkout. Clicking the name of the payment gateway will take you direct to a screen to setup or adjust your settings. If you try to enable a payment method that needs extra configuration, it will redirect you to the payment methods setup screen. Free Payment Gateways included in WooCommerce. Go to WooCommerce > Settings > Accounts and Privacy to control options relating to customer accounts and data retention. Note: Accounts and Privacy formerly called Accounts prior to WooCommerce 3.4. Allow customers to place orders without an account – Allows customers to check out without creating an account. 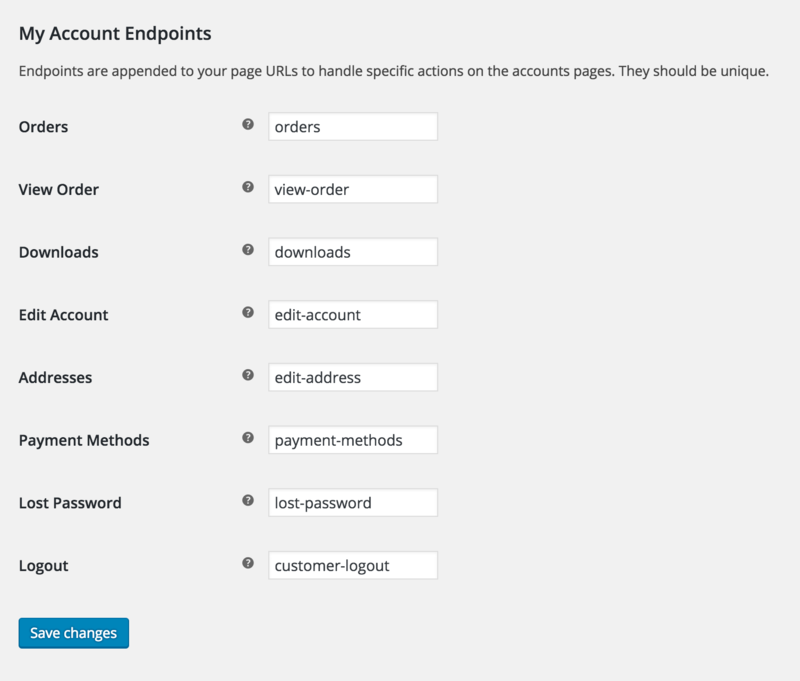 Orders will not be tied to a user account in WordPress. Allow customers to log into an existing account during checkout – This displays a login form and prompt on the checkout page if the customer is not already logged in. Automatically generate username from customer email – If this is disabled, there will be an input box for the user to create their own username. Automatically generate customer password – If this is disabled, there will be an input box for the user to create their own password. Note that while the password strength notification will be displayed, customers can choose any password so as to not limit conversions. Remove personal data from orders – WordPress 4.9 allows you to remove personal data on request. When doing this, if you enable this option, user data will also be removed from your orders if they belong to the user being erased. Remove access to downloads – WordPress 4.9 allows you to remove personal data on request. When doing this, if you enable this option, download data will also be removed if it belongs to the user being erased. The erased user will no longer have access to any purchased downloads if this happens. For each option, enter a number and choose the duration from days, weeks, months, or years. Leaving these options blank will disable them. Retain inactive accounts – Inactive accounts are accounts which have not logged in nor placed an order for the specified duration. Retain pending orders – Pending orders are unpaid or abandoned and should not need to be fulfilled. Retain failed orders – Failed orders are unpaid or abandoned and should not need to be fulfilled. 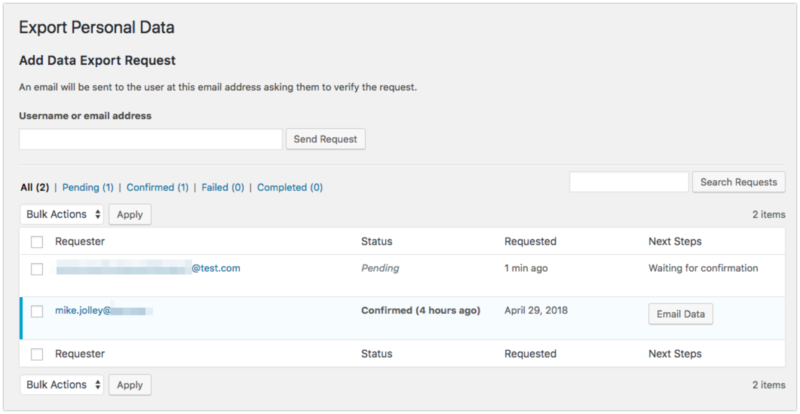 Retain cancelled orders – Cancelled orders were orders cancelled on purpose by either the admin or the customer, or timed out waiting for payment. Retain completed orders – Completed orders were fulfilled in the past. Enter an email address or username. User is notified via email with a confirmation link. Email with link to download their personal data is sent to the user. Options available to edit email settings and templates. Go to: WooCommerce > Settings > Emails. For each WooCommerce email listed, it’s possible to configure your settings (optional). More detailed instructions below in: Editing Individual Email Templates. Set the ‘From’ name and email address for the sender. 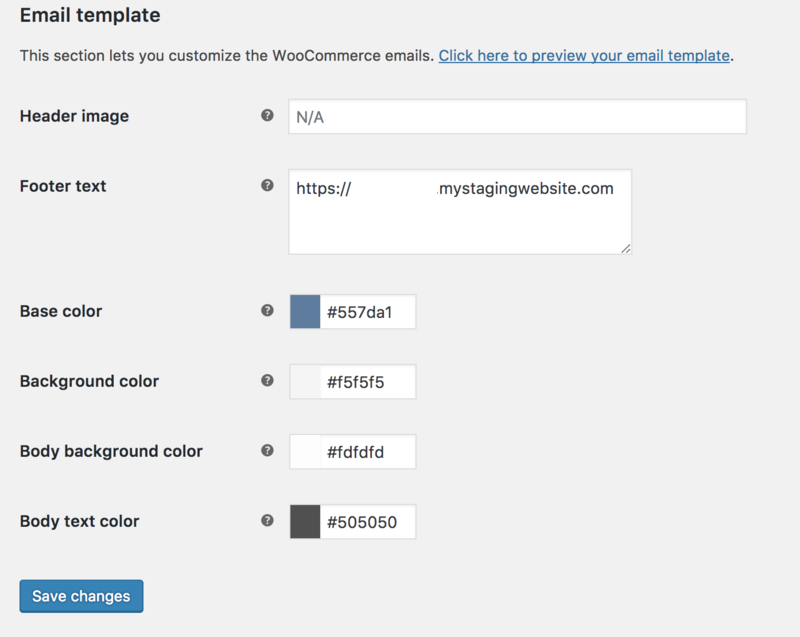 This section lets you customize WooCommerce emails. Enter the URL of an image you want to show in the email header. You can upload an image via the Add Media button or Media > Add New. Base Color – Color for WooCommerce email templates. Background Color – Background color for WooCommerce email templates. Email Body Background Color – Main body background color. Email Body Text Color – Main body text color. For more advanced control, copy the woocommerce/templates/emails/ folder to yourchildtheme/woocommerce/emails/. We recommend keeping customizations in a child theme, so changes are not overwritten when performing updates More at: How to set up and use a child theme. Click the gear wheel on the right side, and a new screen appears. Enter recipients (comma separated) for this email. Defaults to info@woocommerce.com. This controls the main heading contained within the email notification. Leave blank to use the default heading. If using Plain Text emails, keep in mind that text fields are limited to 155 characters. If your products have long names and/or numerous variations/add-ons, the field may be truncated. To override and edit this email template, copy woocommerce/templates/emails/admin-new-order.php to your theme folder: yourchildtheme/woocommerce/emails/admin-new-order.php. You can also copy the template file or view it on this setting screen. Advanced settings allow you to change WooCommerce defaults and integrate with the API. Go to: WooCommerce > Settings > Advanced. Note: ‘Advanced’ is a new tab as of WooCommerce 3.4, replacing the API tab. Cart Page – This page shows items in your customers cart. Checkout Page – This page is where your customer will enter their payment information and submit orders. My Account page – This page is where registered customers will go to view their orders or update their account details. Terms and Conditions – This page shows terms and conditions. Secure checkout – Force SSL (HTTPS) on the checkout pages. An SSL Certificate is required, if selected. You need not use the pages WooCommerce installed, but you must have a page set for the Cart and Checkout pages. Otherwise your customers cannot buy and pay for your products. These pages are normally created and set when installing/setting up WooCommerce. To use a Terms and Conditions page, create a new page for it at Pages > Add New, then select the page in the dropdown. The Terms and Conditions appear inline during checkout, and the customer can scroll through content and tick the checkbox to accept. Endpoints are appended to page URLs to handle specific actions during the checkout process. They should be unique. Learn more about WooCommerce endpoints. Endpoints are appended to your page URLs to handle specific actions on the accounts pages. They should be unique. Learn more about WooCommerce Endpoints. Go to: WooCommerce > Settings > Advanced > REST API. Here you can create API keys to work with the WooCommerce REST API. More info at: Generate API Keys. This API is for developers to use. You can enable it to access store data from outside WordPress, e.g., Our iOS app or other external apps. More information at: WooCommerce REST API. More info at: Using WooCommerce Webhooks. Enable the Legacy REST API which is no longer maintained.